ALL HARVEST PICTURES REPRESENTED ON STCOUTFITTING WERE HARVESTED WITH CLIENTS USING STC OUTFITTING NOT PICTURES FROM OTHER SOURCES. WE USE OUR OWN. REFERENCES AVAILABLE UPON REQUEST. STC Outfitting Would Like To Thank All Of Our Friends We Have Made Over The Past Years Hunting Here In The Sacramento Mountains of New Mexico and our future new friends from all over the country. We Offer Elk, Deer, Antelope, Turkey, Oryx ,Barbary Sheep, Ibex, Bear, Javelina And Lion Big Games Hunts as well as All our Predators and migratory Birds and occassionally . We Look Forward To Hunting With You In The Upcoming 2019/2020 Season. We Have Completed A Great 2018-2019 Season . The Lincoln National Forest In the Sacramento Mountain's unit 34 is our home headquarters which we hunt along with other units throughout the state and Surrounding Areas. We Have some of the Greatest Hunting And Trophy Hunting in The State And We Hope to Be Your Outfitter To Help You Fulfill Your Hunting Needs In New Mexico. We Also Offer Cold Storage and lodging rental year around. Please call for pricing. We also offer Gun And Ammo Sales and All Outdoor Accessories you might need during your visit. We are a licensed Federal Firearms Dealer and can provide firearm and archery equipment services. We also Have Private And Public Land Hunting With Landowner Tags Available. 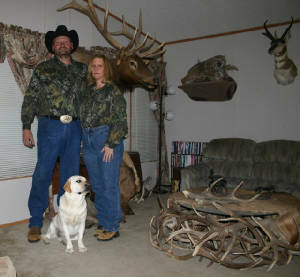 We Thank You in Advance For Letting Us Be Your New Mexico Connection For All Your Hunting Needs. Our 30 plus years of either guiding/outfitting Experience Gives Us The Opportunity To Offer The Hunt You Desire and Deserve. Please Contact Us With Any Questions You May Have. Our Web Sight Has The New Info Dates And Important Updates You Need To Know. We Are A Licensed New Mexico Outfitter and meet all mandated requirements to operate in the State Of New Mexico on National Forest, State And BLM Lands. Our Guides Are Registered And Knowledgeable. We Are A Family Run Outfitter And Live Locally. We Hunt With All Legal Weapons to include Rifle, Bow, CrossBow, Handgun, And Muzzleloader (Modern or Primitive) as allowed by state law.